Pepi I Meryre (reigned 2332–2287 BC) was the third king of the Sixth dynasty of Egypt. His first throne name was Neferdjahor which the king later altered to Meryre meaning "beloved of Rê". Pepi was the son of Teti and Iput, who may have been a daughter of Unas, the last pharaoh of the previous dynasty (V). His two most important wives and the mothers of his two successors (Merenre Nemtyemsaf I and Pepi II) were Ankhesenpepi I and Ankhesenpepi II. Other known wives include Meritites IV, Nubwenet and Inenek-Inti, who are buried in pyramids adjacent to that of Pepi, Mehaa, who is named in the tomb of her son Hornetjerkhet, and a queen named Nedjeftet who is mentioned on relief fragments. He also had a son called Teti-ankh and two daughters, Iput II and Neith, who both became wives to Pepi II. Pepi I's reign was marked by aggressive expansion into Nubia, the spread of trade to far-flung areas such as Lebanon and the Somali coast, but also the growing power of the nobility. One of the king's officials named Weni fought in Asia on his behalf. Pepi's mortuary complex, Mennefer Pepy, eventually became the name for the entire city of Memphis after the 18th Dynasty. The decline of the Old Kingdom arguably began during Pepi I’s reign, with nomarchs (regional representatives of the king) becoming more powerful and exerting greater influence. Pepi I married two sisters – Ankhesenpepi I and II – who were the daughters of Khui, a noble from Abydos and Lady Nebet, made vizier of Upper Egypt. Pepi later made their brother, Djau, a vizier as well. The two sisters' influence was extensive, with both sisters bearing sons who were later to become pharaohs. An analysis of the South Saqqara Stone attests to a 25th cattle count, its highest, during the reign of Pepi I. Evidence indicates that during the reigns of Pepi I and Merenre I Nemytemsaf the cattle count was conducted biennially, thus suggesting a regnal length of 49 years. However, a 50th year of reign cannot be discounted due to a missing fragment of the inscription following. The Turin King List appears to list Pepi I with a reign of 20 years, while his successor Merenre I is accredited with a 44 year reign. This contradicts contemporaneous evidence from the stone whose highest attestation is the 5th cattle count. The Egyptologist Kim Ryholt suggests that the two entries might have been interchanged. Ointment vase celebrating Pepi I's first Sed festival, Musée du Louvre. The inscription reads: The king of Upper and Lower Egypt Meryre, may he be given life for ever. The first occasion of the Sed festival. "Between the mention of count 18 [here] and the next memorial formula which belongs to count 19, end of register D, the available space for count 18+ is the expected half of the average size of a theoretical [year count] compartment. It is hard to believe that such a narrow space corresponds to the jubilee celebration, which obviously had a considerable importance for this (and every) king." Baud notes that there was a tendency during this ruler's administration to mention the first jubilee repeatedly in the years following its celebration—in connection with intense building activity at the king's funerary complex until even to the end of Pepi I's reign when this pharaoh's highest date—the Year of the 25th Count, 1st Month of Akhet day [lost]--from Hatnub Inscription No.3. appears; this ruler's final 25th count is also strikingly associated with Pepi I's first royal jubilee. The South Saqqara Stone confirms that Pepi I's last year was his Year of the 25th Count. Therefore, the references to Pepi I's first jubilee being celebrated in his 18th cattle count are likely just part of this royal tendency to emphasize the king's first jubilee years after it was first celebrated and Michel Baud (and F. Raffaele) both note that the longest year compartment in the South Saqqara Stone appears "at the beginning of register D. Fortuituously or not, this [year] compartment corresponds perfectly to year 30/31, if a strictly biennial system of numbering is presumed" for Pepi I's reign. (i.e. his 15th count) Therefore, the count was mostly likely biennial during Pepi I's reign and the reference to his final year—the 25 count—implies that he reigned for 49 full years. An artifact bearing Pepi's name found in a layer of a temple at Ebla, Syria destroyed in the 23rd century BC became one of the primary strengths for synchronizing the dates of the entire Old Kingdom of Egypt, however it has been pointed out that this evidence is weaker than desired, as it was found with a cache of artifacts from earlier pharaohs as well, which may all easily have been centuries old antiques by the time they reached Ebla. Pepi I had a pyramid built for himself in South Saqqara, which he named Men-nefer-Pepi variously translated as "Pepi's splendor is enduring" or "The perfection of Pepi is established". The pyramid was constructed in the same fashion as others since Djedkare Isesi: a core built six steps high from small roughly dressed blocks of limestone bound together using clay mortar encased with fine limestone blocks. The pyramid, now destroyed, had a base length of 78.75 m (258 ft; 150 cu) converging to the apex at ~ 53° and once stood 52.5 m (172 ft; 100 cu) tall. Its remains now form a mound a meagre 12 m (39 ft; 23 cu), containing a pit in its centre dug by stone thieves. The substructure of the pyramid was accessed from the north chapel which has since disappeared. From the entrance, a descending corridor gives way to a vestibule leading into the horizontal passage. Halfway along the passage three granite portcullises guard the chambers. As in preceding pyramids, the substructure contains three chambers: an antechamber on the pyramids vertical axis, a serdab with three recesses to its east, and a burial chamber containing the king's sarcophagus to the west. Extraordinarily, the pink granite canopic chest that is sunk into the floor at the foot of the sarcophagus has remained undisturbed. Discovered alongside it was a bundle of viscera presumed to belong to the pharaoh. The provenance of a mummy fragment and fine linen wrappings discovered in the burial chamber are unknown, but are hypothesized to belong to Pepi I. The walls of Pepi I's antechamber, burial chamber, and much of the corridor[a] are covered in vertical columns of inscribed and painter hieroglyphic text. His sarcophagus is also inscribed on its east side with the king's titles and names, as part of a larger set of spells that include texts at the bottom of the north and south walls opposite the sarcophagus, and in a line running across the top of the north, west, and south walls of the chamber. The writing comprises 2,263 columns and lines of text, making them the most extensive corpus of Pyramid Texts from the Old Kingdom. The tradition of inscribing texts inside the pyramid was begun by Unas at the end of the Fifth Dynasty, but originally discovered in Pepi I's pyramid in 1880. Their function, in congruence with all funerary literature, was to enable the reunion of the ruler's ba and ka leading to the transformation into an akh, and to secure eternal life among the gods in the sky. "[he] who was publicly associated as his father's successor on the occasion of the Jubilee. 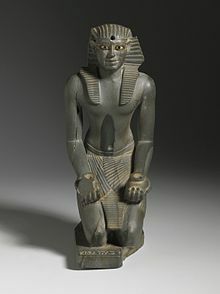 The placement of his copper effigy inside that of his father would therefore reflect the continuity of the royal succession and the passage of the royal sceptre from father to son before the death of the pharaoh could cause a dynastic split." More recently, however, it has been suggested that the smaller statue is in fact that "of a more youthful Pepy I, reinvigorated by the celebration of the Jubilee ceremonies." Pepi I was a prolific builder who ordered extensive construction projects in Upper Egypt at Dendera, Abydos, Elephantine and Hierakonpolis. One of his most important court officials was Weni the Elder who had a great canal built at the First Cataract for the king. Weni was singly responsible for hearing an unusual charge against a Queen Weret-yamtes, a resident in Pepi’s harem. Weni gives no further information on this event. At Abydos, Pepi I had built a rock cut chapel for the local god Khenti-Amentiu. ^ The corridor texts in Pepi I's pyramid are the most extensive, covering the whole horizontal passage, the vestibule, and even a section of the descending corridor. Unas' pyramid constrained the texts to the south section of the corridor, as did Teti's. The texts in Merenre I's and Pepi II's pyramids covered the entire corridor and the vestibule. Wikimedia Commons has media related to Pepi I. ^ a b c d e f Leprohon 2013, p. 42. ^ Leprohon 2013, p. 236. ^ a b Clayton 1994, p. 64. ^ a b c Grimal 1992, p. 84. ^ Baud 2006, p. 148. ^ Strudwick, Nigel C.; Leprohon, Ronald J. (2005). Texts from the Pyramid Age. ISBN 9004130489. ^ a b c Baud 2006, p. 150. ^ Michael C. Astour, Eblaitica 4, p. 60. ^ a b Lehner 2008, p. 157. ^ a b Verner 2001d, p. 351. ^ a b c d e Lehner 2008, p. 158. ^ Verner 2001d, p. 352. ^ Verner 2001d, pp. 325 & 352–353. ^ Lehner 2008, pp. 157–158. ^ Verner 2001d, pp. 353–354. ^ a b Hellum 2007, p. 107. ^ a b Verner 2001d, p. 354. ^ a b c Allen 2005, p. 12. ^ Hays 2012, p. 111. ^ Lehner 2008, p. 154. ^ Allen 2005, p. 97 & 100. ^ Allen 2005, p. 97. ^ Malek 2003, p. 102. ^ Allen 2001, p. 95. ^ Verner 2001d, pp. 39–40. ^ Allen 2005, pp. 7–8. ^ Lehner 2008, p. 24. ^ Verner 1994, p. 57. ^ Grimal 1992, p. 126. ^ Hays 2012, p. 10. ^ a b c Bongioanni & Croce 2001, p. 84. ^ Bongioanni & Croce 2001, pp. 84–85. ^ Bongioanni & Croce 2001, p. 85. ^ Grimal 1992, p. 83. ^ Kraemer, Bryan (June 2017). "A shrine of Pepi I in South Abydos". Journal of Egyptian Archaeology. 103 (1). pp. 13–34. Allen, James (2001). "Pyramid Texts". In Redford, Donald B. (ed.). The Oxford Encyclopedia of Ancient Egypt, Volume 3. Oxford: Oxford University Press. pp. 95–98. ISBN 978-0-19-510234-5. Allen, James (2005). Der Manuelian, Peter (ed.). The Ancient Egyptian Pyramid Texts. Writings from the Ancient World, Number 23. Atlanta: Society of Biblical Literature. ISBN 978-1-58983-182-7. Baud, Michel (2006). Hornung, Erik; Krauss, Rolf; Warburton, David (eds.). "The Relative Chronology of Dynasties 6 and 8". Ancient Egyptian Chronology. Handbook of Oriental Studies. Brill. Bongioanni, Alessandro; Croce, Maria, eds. (2001). The Treasures of Ancient Egypt: From the Egyptian Museum in Cairo. Universe Publishing, a division of Ruzzoli Publications Inc.
Hays, Harold M. (2012). The Organization of the Pyramid Texts: Typology and Disposition (Volume 1). Probleme de Ägyptologie. Band 31. Leiden, Boston: Brill. ISBN 978-90-04-22749-1. ISSN 0169-9601. Hellum, Jennifer (2007). The Pyramids. Westport, CT: Greenwood Press. ISBN 9780313325809. Verner, Miroslav (1994). Forgotten Pharaohs, Lost Pyramids: Abusir (PDF). Prague: Academia Škodaexport. ISBN 978-80-200-0022-4. Archived from the original (PDF) on 2011-02-01. This page was last edited on 14 December 2018, at 10:52 (UTC).